The Good Samaritan Hospital in Dayton, Ohio, has been a long-standing place of service to the Sisters of Charity of Cincinnati since its beginning in 1932. The hospital has been a staple of integrity, love, and quality care because the mission and values of the Sisters have always been at its heart. For over 85 years, many Sisters have made their mark on the hospital through their service and expertise as nurses, caregivers, spiritual leaders, volunteers, and so on. Even though we bid farewell to Good Samaritan Hospital on July 22, 2018, we cannot forget all that has been done to better the Dayton community and the many memories the Sisters have made in their various ministries. For Sisters Roslyn Hafertepe, Jeanne Roach, and Maria Dolorata Felix, Good Samaritan Hospital Dayton was their first mission as Sisters of Charity. 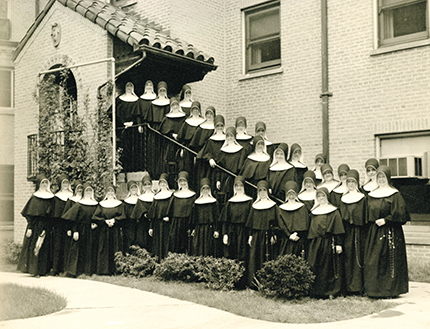 Right after they made their First Vows, they became nursing students for three years and S. Roslyn recalls “countless treasured memories.” With about 40 Sisters ministering at the hospital at the time, S. Jeanne says you could find a Sister down every floor. Having just been given daunting work as a new and young nursing student, S. Jeanne reminisces about the kindness that was bestowed upon her by the older Sisters whenever she needed help. Her happy memories of her first mission were made because of the Sisters hard work and the caring atmosphere they created. She emphasizes that caring for the poor was always made a top priority and they never turned anyone away, always making sure they received the very best the Sisters could offer them. 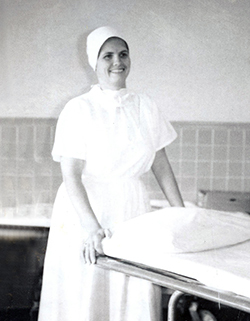 S. Clarann Weinert became a nursing student at Good Samaritan Hospital in Dayton in 1958. S. Roslyn remembers the great efforts to reach out, especially on behalf of the students from third-world countries. Many of her fellow nursing students came from these countries and they and their families were nurtured by the Sisters. S. Mary Pauline Tsai, and the late Sisters Lucia Mao and Francis Roberta Chin, natives of China, were also fellow nursing students there. One exceptional story comes from S. Maria Dolorata, who as a nursing student, was riding in the small convent elevator one day and smelled smoke. When she looked up, she saw fire in the ceiling. Thinking quickly, she pushed the button for the hospital kitchen and ran to the kitchen supervisor, who called the fire department. On this day in 1953, the swift actions of the young S. Maria Dolorata saved Good Samaritan Hospital as well as the convent on the corner of Salem Avenue and Philadelphia Drive. S. Clarann Weinert has been connected to Good Samaritan Hospital in Dayton since she was born there on one of the hottest days in the history of the city. As a child, S. Clarann always admired her aunt, Rosa Lee Weinert, who graduated from Good Samaritan’s nursing school in 1949 and worked in an operating room for 16 years. Sister had no doubt that she wanted to become a nurse and began her journey as a student in 1958, loving it immediately. Having been active in sports since she was a child, S. Clarann has fond memories of playing on the Good Samaritan basketball team of nursing students and playing against other teams of nursing students in the area. She was able to plead with the late S. Ann Seton Gallagher about getting new basketballs and uniforms to replace their dismal equipment. She recalls winning the championship game which was dedicated to her and having a pizza party with both teams afterward with permission from the late Mother Mary Romana Dodd. During her first year as a nursing student, S. Clarann wrangled over the idea of becoming a Sister of Charity after growing to love and admire them. She recalls having long talks with her dear friend Jo Carol Peters Layman (the former S. Michael Miriam) at the Burger Barn across the street from the hospital and late-night conversations with the late S. Michael Ann Daly who helped her discern her call. In early 1960, S. Clarann made her First Vows and has never regretted her decision. Though not a nurse, S. Mary Fran Boyle recollects, “days of happy memories,” at Good Samaritan Hospital. In 1966, she and the late S. Rose Collette Casey were sent to live with the Sisters at the hospital because there was no room for them in the convent at St. Joseph Commercial School, in Dayton, where they were teachers. S. Mary Fran lived there for one year and still remembers how great the food was. One weekend, the Sisters made enchiladas for dinner. Because most of the 44 Sisters living there at the time had ministered in the West before, they all appreciated the authentic and delicious meal. She also recalls fun times of playing six-handed triple deck pinochle with three sets of partners and the loveable dog, a German shepherd named Regina. In the fall of 1997, S. Mary Fran Davisson began her ministry in massage therapy at the Good Samaritan Hospital Well-Being Center. She shared a room with an electromyography technician and often worked in the evening. Several staff members, including Anne McNeill, Alice Riancho, Phyllis Bills, and Sandy Mills, supported and encouraged her as a newly licensed massage therapist which allowed Sister to gain the trust of many clients. She says Good Samaritan was a wonderful place to begin her new ministry. S. Carol Bauer began serving at Dayton Good Samaritan Hospital in 1977, most recently she was the vice president of mission effectiveness. Since 1977, S. Carol Bauer has served at Good Samaritan Hospital Dayton, which is one-third of the time that the Sisters of Charity ministered there. As the ‘matriarch’ of the hospital and former vice president of mission effectiveness, S. Carol has consistently helped the hospital keep focused on its mission of building a community that cares for the whole person: body, mind, and spirit. Administration and staff have always admired Sister’s dedication and commitment to social justice, fairness, and respect for everyone. Jim Pancoast, a former executive administrator, says, “S. Carol is a reminder of the vision and mission of what the Sisters started.” In addition, she has supported many organizations in the Dayton area and plans to retire this year after the hospital’s closing to pursue volunteer ministries and to travel. 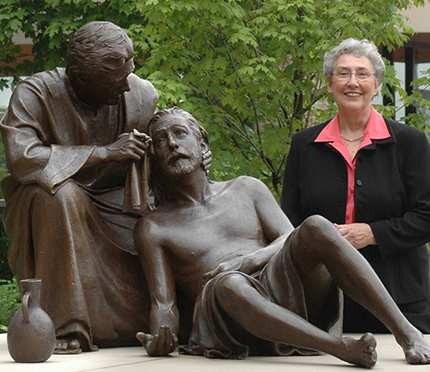 Serving others is how S. Carol chooses to live her life. On the Saturday before the hospital closed, around 850 people gathered together for a ‘family picnic’ to celebrate all that has been achieved since 1932 and to share memories from employees past and present. The history of Good Samaritan Hospital in Dayton is rich with love and care that has never ended. May the leaders of the Dayton community continue to serve the needs of others and show compassion for all.